As increasing numbers of homeowners are trying to make their properties more environmentally-friendly, more and more eco products are appearing on the market. One product that has really taken off is eco paint. Read on to find out more about the dangers of conventional paints and why eco paint can be a great alternative. What’s wrong with conventional paints? 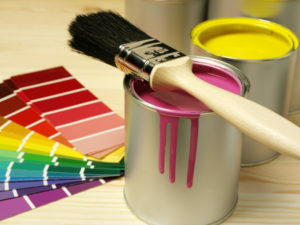 Conventional paints can contain formaldehyde, heavy metals and volatile organic compounds (known as VOCs). These ingredients can be the culprits behind the dizziness and headaches you might experience if you’re painting without sufficient ventilation. There is worrying evidence to suggest that they can lead to cancer, both when wet and dry. Standard paints can also cause significant environmental damage. They’re made using non-sustainable resources and their manufacture produces around 30 litres of toxic waste per litre of paint. There are regulations in place to limit paint VOC levels, but this doesn’t stop them posing a significant risk to both us and the environment. Eco paint is generally paint that contains less toxic chemicals than standard paints or even none at all. These chemicals are replaced with natural ingredients, like clay, milk and oils. Eco paint also generally contains natural pigments instead of synthetic ones. Due to their high levels of natural ingredients, the best eco paints are compostable and have low-carbon or carbon-neutral production. It can be hard to tell how eco-friendly a paint is when you’re out shopping. Lots of paint manufacturers claim eco credentials when actually their products are still rammed full of chemicals. So it’s a good idea to do your research before you buy. Does eco paint work as well as conventional paint? Eco paints have their downsides. They can be trickier to apply and some require careful mixing. Many also take longer to dry. However, most eco paints are breathable, which make them ideal for bathrooms, kitchens and older properties. Plus they come in a wide range of finishes like conventional paints – so whether you want an interior eggshell or masonry paints and primers, you should be able to find an eco paint that fits the bill. Eco paints tend to be more expensive than basic conventional paints but rarely exceed the prices of premium paints. If you want further advice on eco paint it’s a good idea to speak to a professional. If you’re looking for a decorator, click ‘Start my project’ and complete our online form. We’ll put you in touch with up to 4 professionals in your area.